According to a Quinnipiac University national poll, 66 percent of American voters think the nation’s economy is “excellent” or “good.” This was the highest positive rating for the economy since 2001, when the poll first asked the question to voters. In addition, 73 percent of voters said their personal financial situation is “excellent” or “good,” while 26 percent said “not so good” or “poor,” according to the same poll. The survey also found that 37 percent of voters think Trump policies are boosting the economy. In another question, however, 49 percent of voters say President Barack Obama is more responsible for the economic growth, while 40 percent think Trump is more responsible. The economic outlook has changed dramatically over the last one year. One month before the presidential election in 2016, Americans cited the economy as the most important problem in the country followed by dissatisfaction with the government, according to a poll conducted by Gallup in October 2016. And this was the case throughout the year in 2016, stated Gallup. In addition to the economic outlook, business optimism also increased sharply in the last one year. U.S. companies are increasingly confident about expanding their businesses and increasing wages thanks to the Trump administration’s pro-business policies. In response to the tax cuts, over 100 companies have announced increases in wages and bonuses for their employees. 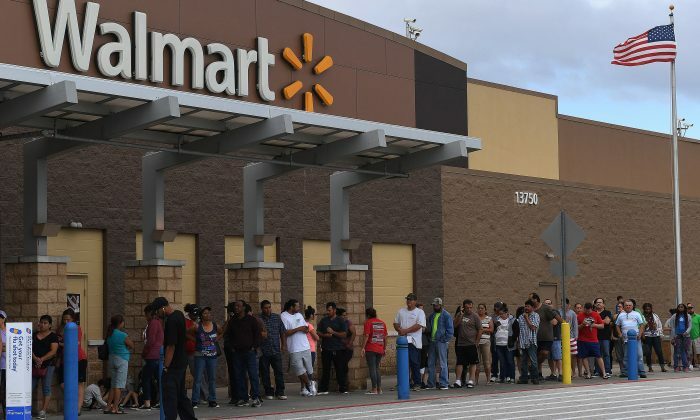 “Walmart is the latest company to make such an announcement, directly result of the Tax Cuts Act, and they join over 130 other companies across the nation who have already given such relief,” said Treasury Secretary Steven Mnuchin at the White House daily press briefing on Jan. 11. “This is really a revolutionary process,” he said. The retail giant announced that it would increase the minimum wage for its workers to $11. It would also expand maternity and parental leave benefits and provide a cash bonus of up to $1,000 for its eligible employees. Walmart is the largest private employer in the country. “We’re now up to over 2 million workers that have seen either special bonuses or additional wages,” said White House press secretary Sarah Sanders on Jan 11. It is “further evidence that the tax reform and tax cut packages are having the impact that we had hoped,” she said.